Choose Buffalo grass - for general lawns. • Buffalo grass (Stenotaphrum secundatum) requires less regular mowing, and being indigenous, it is also less susceptible to fungus diseases. • Buffalo is less invasive to flower beds, pathways, etc. than other lawns. • When Buffalo thickens into a healthy lawn, weeds are strangled. • Buffalo is shade tolerant, enjoys dappled sunlight, but will not grow in total shade. • If left wild in shade or sunlight, mowing, feeding and watering can be reduced drastically; it is an ideal hassle free ground cover. • Buffalo grass requires less watering than other lawn grasses. • Once established, Buffalo lawns can be left wild if required with very little or no watering at all. Bayview fine lawn grass (Cynodon dactylon) is the preferred choice for bowling, greens, cricket pitches and putting surfaces. Available in roll-on form, runners, and speed grass trays. Berea is a very soft bladed lawn grass that exhibits an incredibly high tolerance to shade, it is can be grown in both sun and shade. It has a similar root structure to buffalo grass. Please remember to set your grass mowers to the maximum height when cutting grass that grows in high shade areas, the grass needs a larger blade surface to help photosynthesize in low light areas. Berea is tolerant of medium levels of traffic. · It has a lighter grass shade colour than buffalo grass. Level ground as required, allowing for adequate drainage in clay soils. Dig over ground to one spade depth, adding compost or well-rotted manure, in large quantities. Complete fine levelling and water ground well. Using a nylon line and two wooden pegs as a guide, dig a shallow trench approximately 50mm deep along the length of the area. (NB : Trench across and not down slopes to prevent erosion). Cut the long grass runners into smaller pieces. Keep cuttings fresh in a bucket of water. Plant the grass with roots below and leaves above the ground. Back fill trench, compacting gently by tapping the soil with the back of your spade. 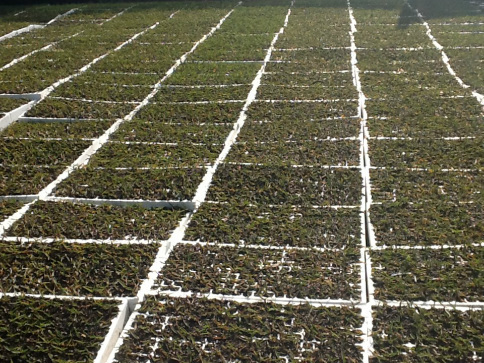 Repeat the above procedure in trenches 150mm to 200mm apart and water well after planting. A light roller will assist compaction but this is not advisable in heavy clay soils. Add compost, bonemeal/superphosphate to existing soil and dig over. Fine level area, water well before planting, ensure that soil is moist prior to laying lawn. Lay sods tightly against one another. Fill gaps between sods with soil/lawn dressing where necessary. Don't roll with a heavy roller. If area is shaded by trees, trim branches to ensure maximum sunlight. Keep soil moist for the first two weeks. Avoid traffic during the establishment period. Remember that Roll On Lawn is not established until deep rooting takes place. Avoid mowing grass too low! In shade do not cut the grass at all or very seldom; do not cut in winter. Do not top dress until the lawn is well established. Pop the plugs out to the tray by pushing your finger or a stick from the bottom upwards, then lift the plug gently by its stem. Make a small indentation in the soil to receive the plug, and press stem firmly into the ground. For the first two weeks, keep the planted areas well watered with a fine sprinkler. Thereafter, chemical fertilisers may be added to boost the growth, but care should be taken not to burn the new grass. Water well before and after application. Traffic over planted areas should be kept to a minimum during the establishment period. Weed the lawn regularly. Once the roots have become established, the lawn can be levelled with a light top dressing of weed-free soil. (Use sand/compost mix for clay soils and light loam compost mix for sandy soils). Do not smother the lawn with top dressing. Blades of grass should stick out above the lawn dressing after application. To prevent fungal infection, avoid watering after 2 o'clock in the afternoon. 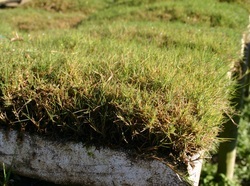 Also ensure that all the grass cuttings are collected after mowing. Avoid all compaction, and aerate lawn from time to time by spiking same with a garden fork.